Do you enjoy knitting gifts as much as we do? And what feels more rewarding than being able to work up a hat in just a few hours? We have a whole collection of great hat patterns to share with you this week. 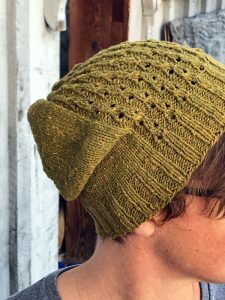 Our friend Mina (aka Knitting Expat) recently published the New York Hat Collection, and we love each and every one! 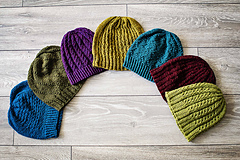 This assortment of 7 patterns could provide you with a unique hat for everyone on your holiday list! Mina has created seven designs named after New York landmarks, locations, and one subway line. All of the patterns include 6 size options from baby to large adult. They call for either Aran weight or DK weight yarns, so these beanies will knit up quickly keep your loved ones’ ears cozy warm this holiday season no matter what the weather throws at us. Mina generously offered to let us have a couple of her samples and so we have her Union Square Hat (on the left) and Q Train Hat (on the right) here in the mill shop. As you can see, it’s the details that make these patterns so much fun. Each design features a different stitch pattern that pops with crisp detail. All of these patterns have been knit up with Spinnery yarns! Her Q Train, The Avenues and Central Park patterns all call for our Weekend Wool. Union Square, Times Square, Yorkville and Grand Central each call for Spinnery Mewesic. 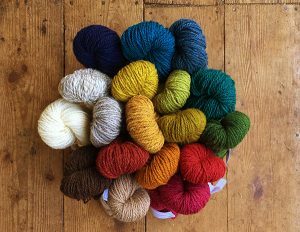 Our palette of tweedy yarn colors will make these projects as fun for you to knit as they will be to wear. The New York Collection patterns are available as an e-book which will give you a 40% discount over purchasing the patterns individually. 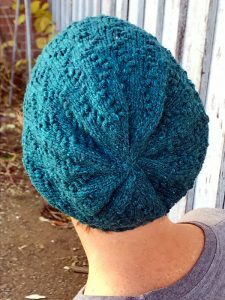 If you start now, you could make a hat a week and get them all knit up before New Years!